ESD labels (compliant with EN61340-5-1) must appear on all packaging containing static sensitive devices. At Antistat, we offer a wide range of labels for electronics to compliment your ESD program, including JEDEC approved moisture barrier labels conforming to IPC/JEDEC J-STD-033 and JEDEC113. From ESD Caution labels in multi language to self-adhesive inspection labels and lead-free variants. ESD Caution labels are ideal for identifying ESD sensitive items enclosed within packaging. This rigid ESD Protected Area Sign is ideal for cleanroom and ESD protected workspaces. 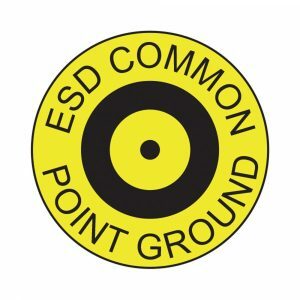 Printed in yellow and black onto 3mm foamex, the written message is accompanied by the ESD cautionary logo. Available in a variety of languages other than English. Contact the team for more details. Our self-adhesive, yellow ESD Caution labels in German, are ideal for the marking of electrostatic sensitive devices. Suitable for use in environments ranging from -20oC to 80oC. Sold in rolls of 1,000 in two different sizes.